How to Write..If you have the passion to write, then how is easy. You can’t learn to be a writer .. It’s a gift, a passion. You need more than lessons on how to write to become an author. If you have a constant compulsion to write, to express yourself by putting pen to paper or fingers to key board, you already have something that can’t be taught. You have a passion for writing; the rest is down to commitment and making time in your life to follow your passion. You can learn how to spell, punctuate, analyse and parse. You can learn how to edit, form sentences, paragraphs and chapters. You can even learn how to enhance the readability of your story. But to be a successful writer, you need to have a gift and a passion for telling stories. You must feel a sense of excitement and inspiration when an idea for a story comes into your mind. If you have this passion then just start writing. It is not a matter of learning how to write, it is then a matter of honing your craft, and the best way to hone your craft and develop your unique style is to keep writing. If you are a reader, and most passionate writers are, you already know what good prose reads like. Read and re-read your writing. Keep changing it until you think it reads well. Finish your projects, polish them as much as you can, then give them to someone to assess. If you are a first timer, no matter what the “Experts” say, the someone you choose can be your mum, or a relative or friend who is an avid reader. This is where you will get your first indication of the effect your writing has on others. Firstly you must be writing for yourself not fame and fortune; then if others like your stories, it’s a bonus and it will give you the inspiration to write more. I suppose planning your story comes under the heading of Learning How To Write. You will develop your own style of planning your stories, but I found a free software download that I use, to be my best planning tool. You can map out the story, characters and locations before you start your story and it gives you a plan to follow. Your story will still take you places that you didn’t expect, so when it does you just change the plan. It also helps you to remember minor character’s names as they bob up in your stories or even sequels to your stories. You will find it here. But once you get the sugar hit from the family and friends and if you have enjoyed the process, it’s time to get the experts in. Have the manuscript edited professionally and get some professional reviews. Careful who you use, research them, there are many charlatans out there, ready to take your money and leave you with something you could have done better yourself. I’m only comparatively new at this, but after publishing my second novel this year, I think I know how to write, now I’m working on how to write better. I guess what I’m saying is, don’t let anyone or any hurdle discourage you, just write. Read and research what you can about the process and enjoy yourself, it’s very rewarding. Keep in touch, as I learn more on how to write I’ll pass it on in little tidbits. Next I’ll tell you what I know about self publishing. Firstly, thank you for the like on my post. I appreciate it. I just self-published my memoir: Wildflower: An Abducted Life on Amazon. I have always kept journals and enjoy writing stories and poetry but never set out to write a book. What started out as a catharsis had now set me on the path of writing professionally. I am now working on a murder mystery novel and thoroughly enjoy the process of researching and writing. It is rewarding as you have pointed out. I am looking forward to reading more about your works and your posts. Unfortunately, I am having problems with WordPress. It is not allowing me to like any blogger’s posts and I have to sign in any time I comment. It is most frustrating but I am hoping that this comment gets to you. Cheers, and thank you for sharing! Thanks for your note Nancy. Yes, writing is one of my greatest passions. I hope you receive as much joy from it as I do, you obviously are one of the lucky ones, not everyone is a writer. 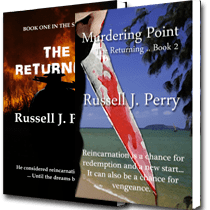 I’m off on another adventure now, with my characters from the third book in my “The Returning” series.